Jesus' disciples were arguing over who was going to be granted the most prestigious place in the Kingdom of God. In reply, Jesus turns conventional values on their head. "The first will be last, and the last will be first (Matthew 19:30, 20:16, Mark 10:31, Luke 13:30)." Whoever want to lead must serve (Matthew 23:11, Mark 10:44). Such radical teaching is very likely the only lasting remedy to the all-too-common principle: "power corrupts." right, for so I am. 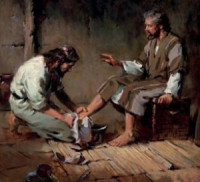 14 If I then, your Lord and Teacher, have washed your feet, you also ought to wash one another's feet. 15 For I have given you an example, that you also should do just as I have done to you."